Photographic Tips, Techniques, Videos curated from the experts. Tutorials, Techniques, How-To, Latest Articles, Be Inspired, Photo News, Photojournalism Pages are updated regularly. Visit regularly and be inspired. Look forward to your comments. Everyone loves to take photos when they travel. It’s a way to maintain the memories, to share experiences with our friends and families, and, quite simply, a way to prove “I was there.” But let’s face it—not everyone is a great photographer. At one point or another, we’ve all sat through a tedious slide show of seemingly endless travel snapshots. 1. Don’t put yourself in every shot. Yes, you were there. Yes, your family was there. But having your entire crew posing in front of—and blocking the view of—the Grand Canyon is not an interesting shot. Take a few photos of the landscape or point of interest with no one in the frame. This creates a context for the vacation: the backdrop, the start of the story. But don’t try to capture everything. When I was recently in the French Alps, I was surrounded (literally) by towering, impressive mountains. There was no way I could capture their grandeur in a single frame. So instead, I focused on a few “interesting” peaks so I could focus on the rugged detail. Once you’ve got your basic shots out of the way, take one or two photos with the group (whether it’s just yourself or twenty of you) in front of the landmark or scenery. 2. When you do include yourself, make it subtle. There are a number of ways to say “I was here” in a photograph, without a formally posed snapshot. Having everyone grouped together, squinting in the noon sun isn’t generally very interesting, and it doesn’t tell any sort of story. Instead, take more candid shots of your traveling companions as they’re observing the landmark or talking to each other about it. Make many of your shots be action shots: capture people pointing at something and talking to one another about it. Just don’t forget to include whatever they’re pointing at in the frame, too. That makes the story come alive. 3. Look for the everyday. This is especially true when you’re visiting a more exotic location, but it can apply to any holiday. Don’t focus so much on the landmarks, as on the actions and emotions of the locals. When I was in Mali, photographing the local children in their villages (with their permission) gave my photos much more human interest and context than just shooing them away and capturing the village empty of people. The story of the village is, after all, in the people who live there. But even in a less exotic location, look around. Don’t be afraid to take photos of other people, if that makes the photo interesting. For example, you can be visiting Disneyland, and you may capture the glee on another child’s face after she witnesses something particularly spectacular. Holiday shots don’t just have to include your own traveling companions if there’s an interesting story to tell that highlights the feeling of the place you’re visiting. Of course, your vacation photos will include the ‘typical’ landmarks; they can’t (and shouldn’t) be avoided. But try to add interest by capturing the scene from a slightly different angle. Walk a few feet off the beaten path (either literally or figuratively) to take photos that are slightly different. After you take a photo, think to yourself, “Could I find this exact image a million times on the internet?” If so, you may want to consider a different approach. Perhaps try a different angle or include some interesting people, or wait for a different time of day. When I went to Kyoto, the famous Fushimi Inari temple (with thousands of bright orange/red prayer arches that create long corridors; Google it and you’ll know what I’m talking about) has been taken so many times, and I didn’t want just another collection of typical shots of this amazing place. So I went at dusk and took the ‘corridors’ on a long exposure. The result is mysterious lighting, but, more importantly, ghost-like images of the people walking through. This captures both the human interest, but also the emotional feel of the place. These are just a few tips to help you begin to think about how you take photos while you’re away. Kevin Harries is a photographer based out of Toronto, Canada, and is the principal of VistaKWH. He has traveled extensively and has never been accused of taking boring travel photographs. He is also involved in fine art photography, with many of his images available through Getty Images, as well as through his website (wh-photo.com). He specializes in large format prints. There are certainly dangerous “bullies” in the world, but photographer Doug Sonders doesn’t believe that pit bulls and other “aggressive” dog breeds should be named among them. After adopting a pit bull mix rescue named Emma from a local animal shelter, Sonders’ desire to advocate for these so-called “bully” breeds culminated in a portrait project called Not a Bully that serves to provide the public with positive exposure to these dogs. “Porter is a really perfect example of what I’m trying to do with this portrait series because here’s an example of a dog that was found beaten, kicked, broken,” says Sonders. “Legislation is where it starts, and education. That’s the whole story. They’re not [bullies]. To top it all of, Sonders is assisted during the photo shoot by Cesar Millan, a dog trainer who is widely known as a “dog whisperer” for his innate ability to understand dog behavior. Millan provides Sonders, Conway, and viewers alike with an expert tip on how to calm a dog during a portrait shoot. Rather than stroking a dog’s fur, Millan prescribes a deep tissue massage up and down middle region of the dog’s back. Depending on the mood you’re trying to capture, any of these lighting setups could be the right one for you. But as always, it pays to familiarize yourself with a variety of approaches. 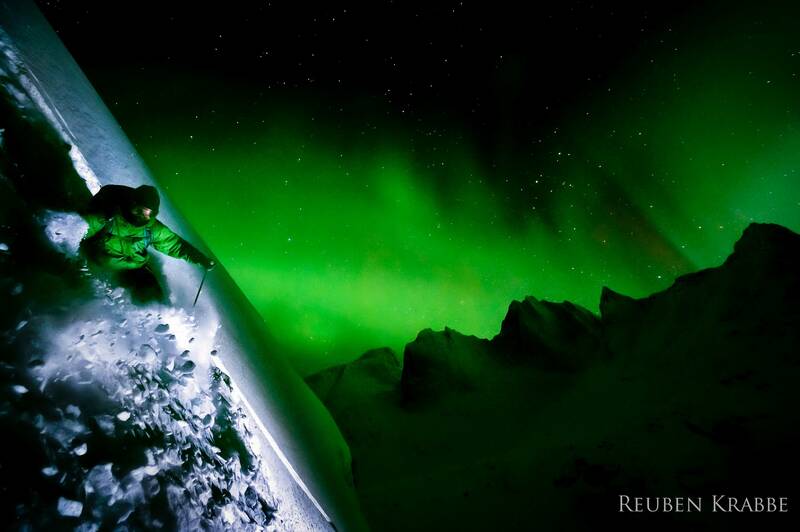 Shot in Tombstone Park, Yukon, the surreal photograph shows the amazing beauty of Aurora Borealis over Mount Monolith, as skier Tobin Seagel cuts his way down the snow covered mountain. The photo was originally printed in SBC Skier Magazine. Krabbe used a Nikon D700 and a 17-35mm f/2.8 lens to capture the image. It is a single photo, captured with flash and long exposure, and camera settings of f/5.6 and ISO 3200. While hiking to Macchu Picchu next to some train tracks, a teenager named Jared Michael Frank had an epic idea for a selfie. He would stand right beside the tracks but angle the camera so that it looked like an oncoming train would hit him. Yes, his social media followers would rejoice this day and the ‘Likes’ and ‘Retweets’ and ‘Shares’ would flow freely. Perhaps Frank’s judgment was impaired by the task of operating his camera backwards, or maybe he was simply distracted by listening to The Chainsmokers’ obnoxious #SELFIE song with his earbuds and honing his mantra for his upcoming portrait. Whatever the case, Frank’s epic fail hints that the seemingly-innocuous selfie craze may not be so harmless after all. The train was only traveling at 17 miles per hour, which explains why the conductor’s well-placed blow didn’t injure anything but Frank’s pride. While some speculate that the conductor might have been trying to save the teen’s life by kicking him away from the tracks, Frank feels skeptical that the man had good intentions since Frank was a “safe” distance away from the train. Preparing for his selfie, totally unaware that doom is upon him. Boot against cheek? Still in selfie mode. Boot propelling head sideways at 17mph? Still in selfie mode. Frank insists that his video is real, but after Jimmey Kimmel’s recent viral video pranks, one involving a girl who accidentally set herself on fire while twerking and another involving a wolf wandering the athletes’ village at the Socchi Olympics, many speculate that Kimmel is behind Frank’s video, too.